UK chancellor George Osborne has left the wine trade 'deeply disappointed' by announcing that wine duty tax will rise with inflation – whilst beer, cider and spirits levies will be frozen. Wine was the only alcoholic drink not to benefit from a freeze in duty in Osborne’s Budget speech to Parliament today (16 March). Scroll down to see how much of the price a bottle of wine goes on tax. In last year’s pre-election budget, Osborne appeased wine drinkers with a freeze on duty – but wine still fared the worst, because beer and spirit duties were cut. Osborne’s announcement may put more financial pressure on the wine supply chain, particularly at a time when the sterling currency has weakened against the euro, effectively making it more expensive to import wine from the eurozone countries such as France, Spain and Italy. ‘The freeze in wine duty in 2015 has resulted in £118m extra in revenue to the UK Treasury in the last 10 months, up 4% [on the previous year], which makes it very unfair that wine has been penalised,’ said Beale. Land under vine in the UK has more than doubled in the past seven years. Wine duty in the UK is the second highest in the EU, and wine has not had a tax cut in the country since 1984, said the WSTA. See a larger version of the graphic here. Privately, several wine trade leaders had not expected a cut this time around, but many will be annoyed that wine was the only drink not to see tax frozen. 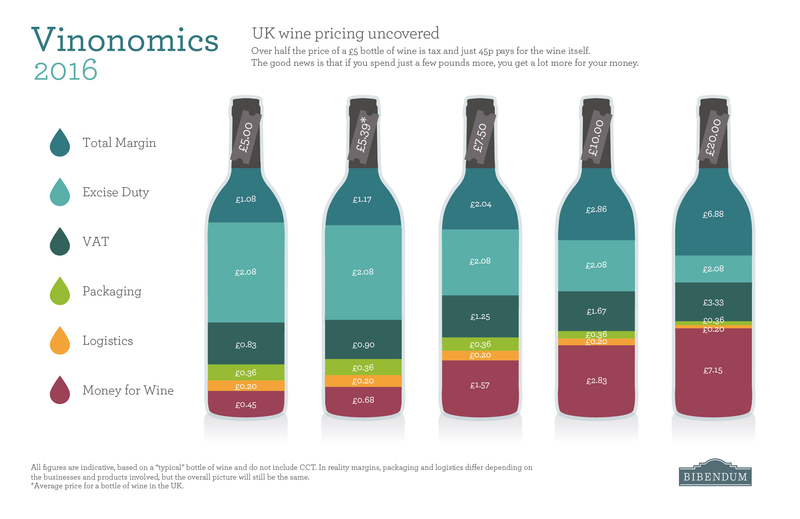 With £2.05 for every bottle of wine going on excise duty, a recent poll by YouGov – and commissioned by the WSTA – showed that 57% of people think that the tax on wine is too high.